Faith and service: is there a connection? The general perception of WW1 military Generals is that they saw their men as cannon fodder. I’m not sure that’s true. A veteran my age who survived a recent war in Afghanistan said, ‘the Army trains its soldiers not to become dead’. A dead soldier is a lost asset which has been hugely invested in. The same was generally true in WW1. One of the things Lord Kitchener was berrated for was not getting men and munitions to the front fast enough. He insisted on the New Armies receiving at least 6 months’ training before being sent to the Western Front and that weapons be made to a high standard as he had lost too many men due to defective weapons in his early Sudan campaigns. A senior military official commented that as he had got older and higher up the ranks so he had become a pacifist. Again this resonated. I’d been reading Kitchener’s farewell speech in India where he commented that a General’s role was to prepare for war and ensure his country was prepared, but to do all he could to stop war from breaking out. Reading John Lee’s chapter in Facing Armageddon (edited by Hugh Cecil and Peter Liddell), I was surprised to read of Hamilton’s objections to the Treaty of Versailles and that he referred to the Treaty of Vereeniging being ‘a generous, soldierly peace’ made by Kitchener himself. Kitchener did not believe in the complete destruction of an enemy. Comments he made before his death in 1916 suggested that he was all in favour of Germany retaining colonies at the end of the war in order to maintain the balance of power. Louis Botha was prepared to forego the annexation of South West Africa in favour of the mandate system in order to bring the war to an end. I can’t say whether the two non-WW1 soldiers referred to above are men of faith or not, because I didn’t ask them. However, I’d be surprised if not, as there is a strong religious focus in remembrance services across the Commonwealth, chaplains quietly get on with their task across the faith groups and I get the impression that the majority of military people I have contact with are people of faith. Reading about some of the Generals who served in World War 1, I was struck by the role of faith in their lives. Kitchener is a good place to start. He wasn’t brought up strongly religious by all accounts but whilst at Staff College, he joined the English Church Union and enrolled in the Army Guild of the Holy Standard. His first official military posting was with the Palestine Exploration Fund where he mapped Palestine identifying over 400 new places and creating the basis of the maps of the area we still use today. Many of the places he came across are mentioned in the Bible and Torah and gave him a sense of connection with the past and by all accounts had a profound effect on him. At this time he also became fluent in Arabic and was able to pass quite convincingly as an Arab even whilst imprisoned. This suggests that he knew more than the language and got to know and understand the religious culture too. By the time he became Agent General in Egypt in 1911, he had a clear understanding of Turkish Law as he worked to improve the rights of the Egyptian peasants. His religion seems to have become all inclusive but it was not something he spoke about. This was evident in his becoming a Free Mason and an active one at that. Numerous Lodges in Africa and India bear his name. Kitchener was completely against the war being fought in East Africa as he knew it would be a long, drawn-out affair for no particular gain but was over-ridden by the politicians back in London. The next General is Douglas Haig who was part of Alan Clark’s Donkey brigade. There are reasons for Generals having their bases behind the lines – security being one. Haig’s religious background was Church of Scotland. During and after the war he was very involved in the Church of Scotland, St Columba’s Pont Street in London where he served as an Elder. 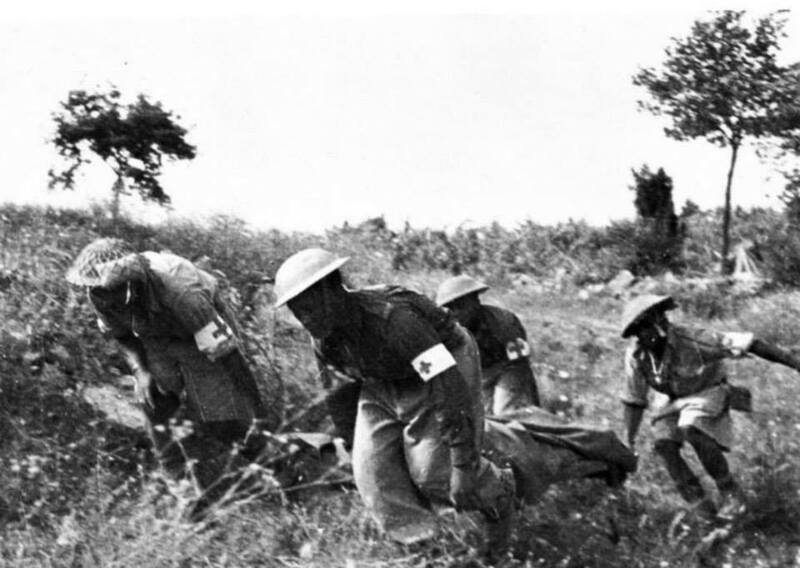 The church also had a close affinity with the British Legion due to Haig’s involvement in both. He had a personal chaplain whilst on the Front and would regularly take communion and attend Sunday Services. Haig’s connection with Africa goes back to the Anglo-Boer War where he made his name leading one of the forces and during World War 1 he sent Smuts a telegram of congratulations after the Central Railway line and the coastal towns had been taken over from the Germans. The two men were to see each other when Smuts moved to London in 1917 and consulted him over the 3rd battle of Passchendale. Related to St Columba’s is the fact that it offered it’s crypt as a place for rifle training during the Great War. Although this might seem strange, it’s not that odd when one considers that the Church of Scotland did not dissociate itself from politics, and that the Pont Street church was a home away from home for Scots living in London. The lunches and soup kitchens provided by the church are well-known in Scottish circles. It also helps to know that the rifles used for training purposes did not fire real ammunition which is what I’d struggled with for years when I first discovered this little-known crypt-fact. This brings us to Jan Smuts, the South African who served in East Africa and who later sat on the British War Cabinet and wrote the Charter for the League of Nations amogst other things. He was brought up Dutch Reformed and was technically meant to go into the Ministry when his brother died at a young-ish age. He did not seem to be a strong adherent to the Dutch Reformed Church. During the Boer War he was known to ride with a copy of the Old Testament in his saddle – in the original Greek and Hebrew. During WW1, whilst in England, he would often be found in the company of Quakers, of whom the Gilletts became long and lasting friends and he supported them in their conscientious objector campaign. And more recently, the other South African who shares a place on Parliament Square with Smuts, is Nelson Mandela who was only born during the Great War years. He was brought up in a strong Methodist faith and attended the Lovedale University run by Methodist Missionaries. His faith remained quietly strong throughout his years in prison. But what is often overlooked is that he was one of the young lions who was instrumental in the formation of the ANC armed wing Umkonto Isiswe and the decision to launch attacks against Government buildings in the struggle against Apartheid. Other religions feature too: Wavell of Wavell’s Arabs was known to have undertaken the Pilgrimage to Mecca. And my references have let me down – there was a commander of one of the Indian units in Nyasaland or Northern Rhodesia who also had made the hajj or pilgrimage. (I’ll add his name when I find it). And strong Christians such as Kitchener and General Gordon (of Khartoum fame) were involved in ensuring Muslims under their supervision were allowed access to their places of worship – Gordon being noted for building a mosque in the Sudan. what role does faith play in a soldiers’ life? how many officers of the Sikhs, Hindu and other Muslim forces shared the same faith as their men? and do we know who they are? The significance of this question being that during World War 1, officers in the British imperial forces were white which then implied Christian. I broke my rule the other day and responded to a hot topic article – within minutes I had someone suggest I look at a current news programme. I haven’t and I won’t – the point of my reply was that exploitation is not only a colour or colonial ‘thing’, it often is economic-based and human nature (greed). I understand the plea for land redistribution and reclaiming. It’s gone on in many countries over many years and not always successfully. Restitution for past wrongs (who determines the wrong?) should be made but this needs to be balanced with the current situation too where often the current inhabitants are oblivious to what happened in the past. If only we’d learn from what has one on before. Not long ago, I was sent a video of someone complaining about Stella McCartney appropriating traditional African material for her 2017 range. To be honest, I think there are at least two issues here which have become confused and amalgamated. I have no issue with Stella using African material – what a compliment. My wardrobe is a mix of traditional African and European materials and have often questioned black African friends who value their African roots why in England they don’t wear their African outfits. ‘I don’t feel comfortable’ is often the answer or ‘I wear them on special occasions’. The main issue I see with Stella McCartney’s range is the price – but again, it’s economics, and a matter of taste – theere is no way I would wear a combination as she has put together, and I’ve been known for doing some obscure fashion things myself. I wonder what we’re really complaining about? Reasons of colour and colonisation seem to be very easy labels to attribute to things we don’t like these days. I can hear someone say, ‘you’re white so it’s easy for you to make such a statement’ – Yes, I’m white, but I’m also African (despite what many in Europe, incl Britain, and America may say) and a minority – in both countries I call ‘home’. And in both, I face challenges for similar reasons – being white, African and colonial (that is being from a colony – shorthand inclusion for dominion too – vs living in a previously colonising territory). My experience has been – take away the colour (incl African) and the colonial issue and underneath will be a range of similarities and invariably another reason or three for the difference being expressed through currently politically correct labels. Only getting down to the real issue will we be able to ‘fix’ the problem. (And yes, sometimes once you’ve done this, it may be an issue of colour – linked with ignorance?). Related to this has been what I’ve seen as divisive discussion about Winnie Mandela following her death. Personally, I distinguish between two Winnies – the early political activist and the later politician. I admire the early Winnie who gave confidence and hope to so many, but I cannot agree with what she did later in life – possibly a response to thinking she had to compete with Nelson for the limelight. Irrespective, I can’t help but recall the plea made by Margaret Thatcher’s family after her death – remember she was somebody’s wife, mother and daughter. Let them grieve the person they knew and loved. The morning I was inspired to write this blog, another parallel link with current events and the complexity of life came to light. In 1908, Jan SMuts was being taken to task for trying to repatriate Indians (Asiatics as they were called then) who had been resident in the Transvaal for years. Volume 2 of his published papers, by Keith Hancock and Jean van der Poel, contains numerous pages on this topc and the outcry of those in England and the Cape around what he was trying to do. The biggest outcry though seemed to be around his wanting to fingerprint all the Indians, and not just their thumb but all ten fingers, the latter being regarded as necessity for criminal cases and the former for civil cases. This brings me back to where I started. It’s all complex and more than colour and colonialism. What the solution is to greater equality is, I don’t know, but I’m sure we’d get a lot closer to one which would satisfy all sides if we took time to understand the real issues underpinning the predicament and worked to solve these – treating all with respect and humanity. The morning I typed this blog, a quote by Jesse Jackson speaking at Wits at some point caught my eye. But who, is happier and more content? I was recently asked what I thought about Jan Smuts’ relationship with the Kindergarten. As with every answer I tend to give, it’s not straightforward to just say ‘good’, ‘bad’ or ‘indifferent’. It evolved. See chapter 4 of Carroll Quigley’s book The Anglo-American Establishment (1981) provides some interesting background to the formation of the Kindergarten suggesting it was a Rhodes-Milner Secret Society. In addition to the main group of Kindergarten, another 5 became associated with it due to their time in South Africa. Below is a list of the 18 men – courtesy of Carroll to which I have added their achievements before answering the question about Smuts’ relationship with them. For students of South African in the early 20th century, many names will be familiar. … the difficulty was not to know what to say, but what not to say, becaue when I think of that man I almost lose all self-control. I see in today’s paper that he and Chamberlain have again been busy fabricating history. Perhaps Milner was not worth so much of your powder, but his policy still haunts the land, and I know of no better remedy against it than your address. After Milner left in 1905, many of the Kindergarten remained in South Africa under the new Governor/High Commissioner Lord Selborne. During this time, their relationship with Smuts and the other Boer leaders began to change. Many helped see the four territories through to Union in 1910 and as noted above, two remained in the country, often in correspondence with Smuts, whilst others made regular visits and continued working in the country. In the Smuts’ letters, Lionel Curtis wrote to Smuts on 25 April 1906 asking him (private and personal) whether he would be prepared to sit on a committee to help find a solution to the Burgher Settlements which constituted 1% of the white population. This group of people was seen to be economically unable to provide for themselves. Curtis was selecting a few individuals who would be able to focus on the issue at hand and not get side-tracked. By the end of the 1914-1918 war, Smuts was reconciled to Milner, the two sitting on the War Cabinet – Milner having worked the way for Smuts to do so – and worked together for Empire at the Treaty of Versailles. Smuts was known to have dinner with Leo Amery who was on Milner’s staff again when Milner was Colonial Secretary during the Versailles Peace Discussions. In this capacity he would have also been in discussions with George Fiddes, who was a prominent Colonial Office official during the First World war years and Smuts’s work on the Mandates, Treaty of Versailles and other colonial issues would have brought them into countact. Similarly, he would have been in close contact with Philip Kerr and Edward Grigg who were secretaries to David Lloyd George during the war years. John Buchan, one of the later Kindergarten arrivals to South Africa after the war, was asked by Smuts to be the official historian of South Africa’s war effort. During the war, Buchan was a member of the Propoganda (Information) Department writing pieces to promote Britain’s war aims. He later died as Governor of Canada. Of those who remained in South Africa either permanently or for a few years after Union, Smuts encountered many in Parliament and joined forces with some when the SA and Unionist Parties joined. What may well have started out as a disparate group of men, became an intricate web of relationships exending through politics, business and literature. Its aim was to build and maintain an Empire (a British one).